De-Stress! Express Yourself! Uplift Your Spirit! Rhythmic drumming, especially when accompanied by chanting & movement, has the power to calm, center, lift depression, release anger and stress emotions, boost the immune system, enhance health and stress-resistance. Co-creative drumming flows best and benefits most when the whole body is involved, so we include some native circle dances drawn from the Celtic, Native American, Hawaiian & Maori traditions. WELL-BEING DRUMMING & TRIBAL CIRCLE DANCE! boost the immune system, enhance health and stress-resistance. 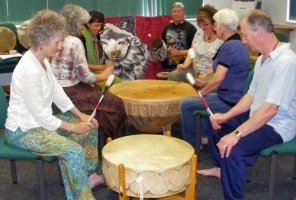 Shamanic Vision Drumming helps us to integrate the conscious and unconscious processes of our psyche. Map, Directions & Public Transport Info. -----oOo----- Bring a frame drum and/or rattle to the above events if you can, otherwise drums & rattles available on free loan. An Email when this Drumming Events page is Updated?